A must see event in the city of lights! Equip Hotel 2018 is next week and we are here to highlight some of the best lighting pieces that are going to be present at this hospitality fair. Some of the best contract floor lamps are going to be available! Brubeck floor lamp is easily one of DelightFULL’s most luxurious floor lamps. Inspired by one of Jazz’s most renowned pianists, Dave Brubeck, Brubeck floor lamp just embodies that mid-century contemporary look, with an asymmetrical design. Featuring all-brass tubes that give this piece a contemporary design, while still maintaining that mid-century influence. Brubeck is the perfect blend between decoration and functionality, something that most contract floor lamps try to achieve, yet, Brubeck is able to due it with style. 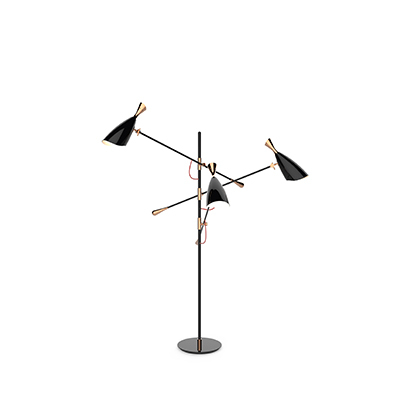 Duke floor lamp is a lighting piece that brings a mid-century vibe to any room it is placed. A piece that could easily be featured in any mid-century modern living room, this versatile piece is fully handmade and features an all-brass body design, and three shades that area blend between brass and aluminum. Sinatra floor lamp captures the essence of Frank Sinatra and embodies the luxurious design style of mid-century New York. Sinatra floor lamp features an all-brass body, customizable and handmade with an aluminum shade. One of the best contract floor lamps in the whole market. An industrial floor lamp that is versatile and easily customizable lighting piece that will fit in even the most demanding settings. This floor lamp exudes a mid-century modern flair in your living room.